Please call or email as soon as possible because these dates may not be available for very long. Or if you would prefer that I call you, please fill out the handy form below! Thanks! 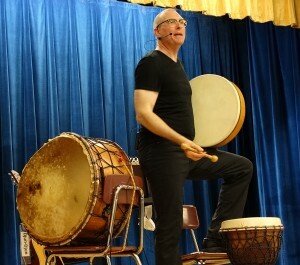 Mark is a multi-disciplinary performing and teaching artist who uses drums, songs and stories to interactively engage, entertain and educate audiences of all ages in performance, keynote and staff development programs. In 2014 his song, “Together We Can Change The World” was honored with a Posi Award and is the theme song of the Girl Scouts of the Philippines.For Mark's full bio click the link.